August 9, 2018-- Toms River Regional Schools Summer Coding Camp, part of the TR:TechReady program made possible by a three-year grant from the Office of Naval Research, concluded today with capstone projects, big-picture reflections, and visits from parents and community members. The big-picture intent of TR:TechReady is to provide students the coding and technological skills to advance to high-paying careers, and to match them with local mentors and community members who can help them get there. The spirit of that goal was on full display in the summer camp, and one prime example included a trolley, an app, and a dream. Downtown Toms River has a trolley that provides transportation to residents. Business Improvement District Executive Director Nick Zorojew, who visited the summer camp early on, had always wanted an app to track the trolley’s whereabouts and provide ETAs on future stops. This idea caught the attention of High School East rising ninth-grader Sabrina Chung, who took on the app’s creation as her capstone project for MIT App Inventor. “I heard about the camp through our school’s email blast, and it was free, so I thought, Why not?” Sabrina said. 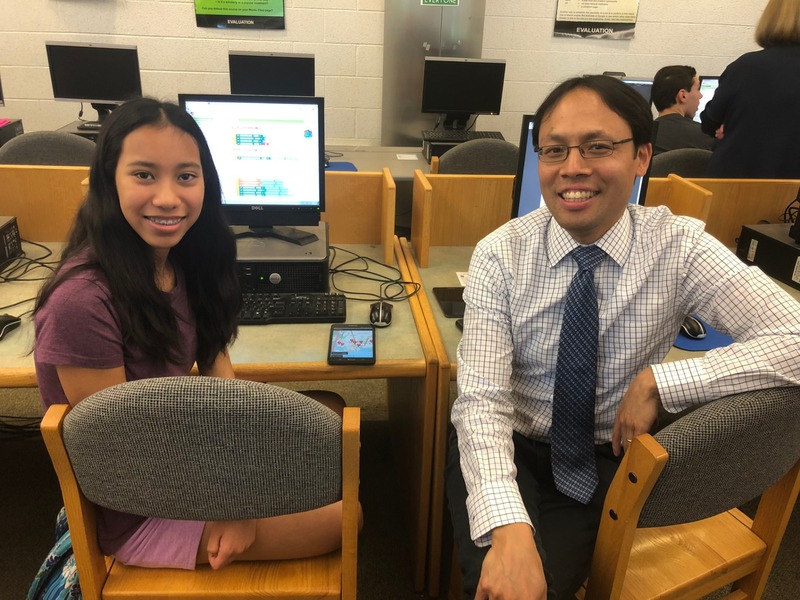 With the help of camp mentor and computer science teacher Matthew Chang, Sabrina began developing the Downtown Toms River Trolly App. Sabrina and Mr. Chang are still refining it-- the trolly currently has a phone broadcasting a signal to the app, and they need to replace that with a more feasible GPS device-- but the bones of the application are solid and in place. They hope to make it available for Android (and, eventually, iPhones) on Google. Shivalika Gupta, a rising senior in Ocean Township School District, met High School North students Vivian Nguyen and Jeff Chang in the summer coding camp’s Arduino session, where they collaborated on building an alarm clock. During session two, they moved to HTML5, where they advanced that nocturnal spirit by writing code for a website dedicated to information about sleep, from the causes of sleep deprivation and its impacts to a faux product page that sells sleep-based items like-- yes-- their alarm clock. “We don’t get enough sleep,” joked Vivian about their inspiration for their capstone project. Being out of district, Shivalika did not know Jeff or Vivian before the summer camp, but they became fast friends, combining their interest in coding to create multiple products on the continuum of a single idea. One of the district’s primary partners for TR:TechReady, which will use naval engineering resources and principles to advance its mission, is the New Jersey Naval Air Warfare Center (NAVAIR) at Lakehurst. The naval base’s education outreach coordinator, Haidy Oliveira, attended the camp on multiple occasions and walked away impressed. “I noticed right away that kids were just really enjoying this,” Oliveira said. “It wasn’t just, it’s summer and I’m bored so I’ll go to this camp. High School North juniors Crystal Pan and Zuha Nasim worked collaboratively to build a travel blog using HTML5. The blog featured countries such as Morocco, Indonesia, and Thailand. The students wrote the blog as if they had traveled to each destination and were reporting back to readers on their travels. Story continues following photos below. 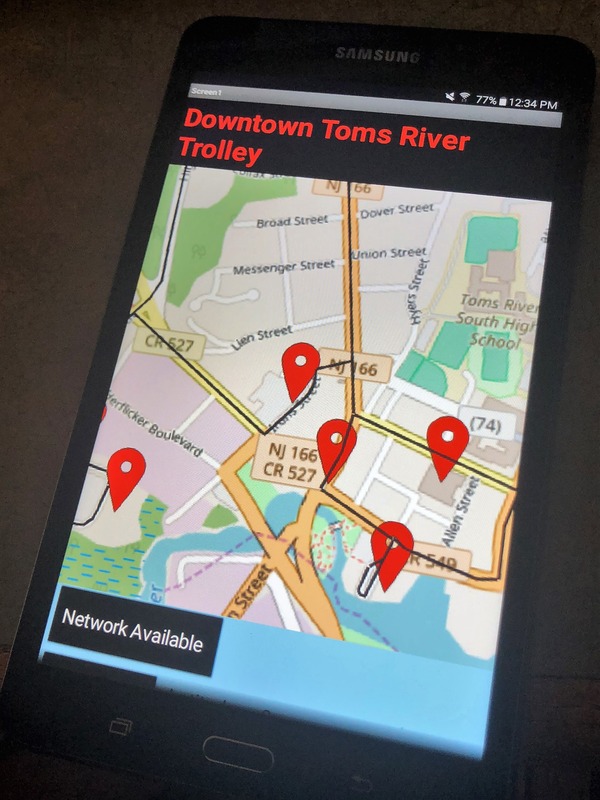 The Downtown Toms River Trolley app (below) maps out the route and locations of TR’s trolley system. It was developed by TRRS student Sabrina Chung, with the help of computer science teacher Matthew Chang. Shivalika Gupta and Jeff Chang used sleep-- or lack thereof-- as motivation to create an alarm clock using Arduino and a website using HTML5. Zuha Nasim (left) and Crystal Pan (right) demonstrate how readers can use their blog, Travel Two, for valuable information. Megan Mulholland used HTML5 to create the blog, We Run the County. It focuses on running, one of her passions. In order to provide content for the blog, the students researched each country and then used HTML5 to design a homepage and linked to several other pages with basic information, top travel destinations, a picture gallery, and links to different activities or excursions that a potential traveler may be inclined to visit. In addition to the code they wrote for the blog in HTML5, they also provided CSS (cascading style sheets) for each page. CSS is a way for web designers to separate the presentation of the pages from the content. Presentation elements in CSS include layouts, fonts, and colors. 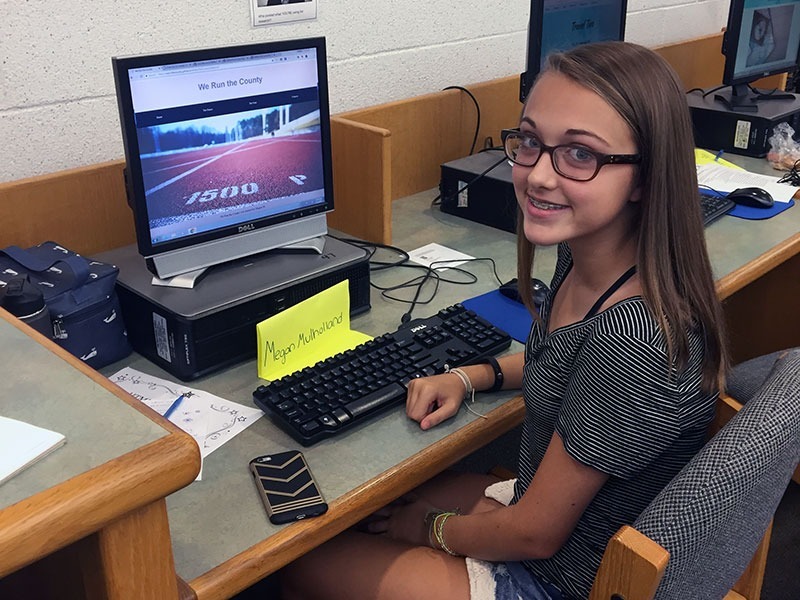 Megan Mulholland, a freshman at High School South, used her knowledge and love of running to create a blog using HTML5 devoted to the sport. Her homepage guided users to pages with information regarding track and field, cross country, running events to enter, gear to use, and tips & advice. She used a lot of her own personal knowledge and linked to outside pages to provide backup documentation for her information. 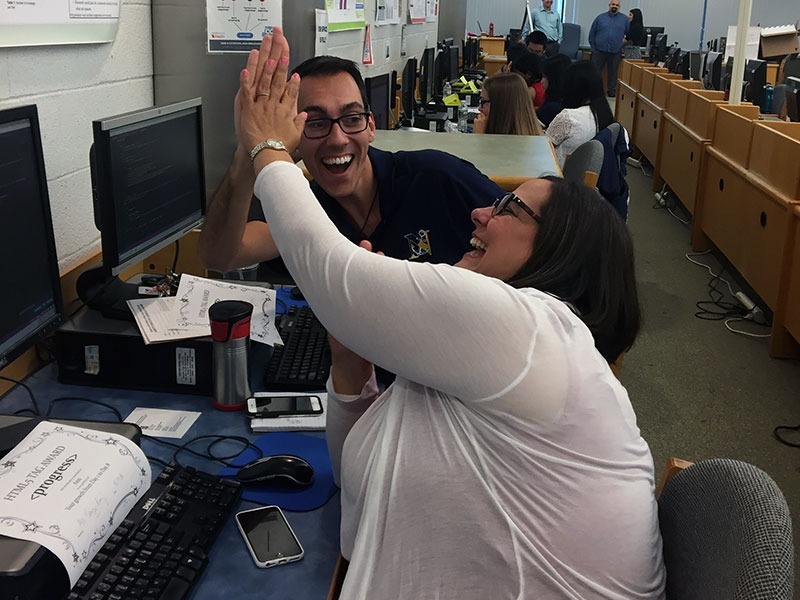 Toms River teachers were also active participants in the summer coding camp. 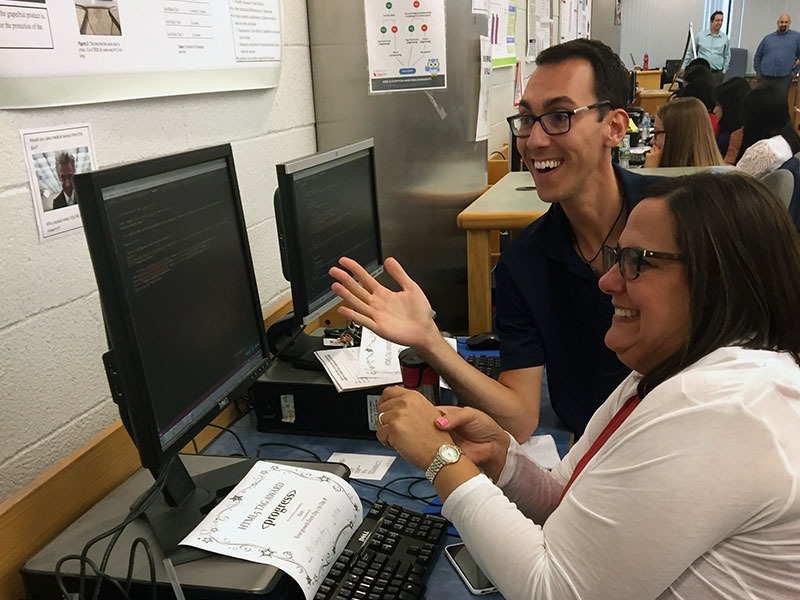 Two High School North teachers plan to turnkey what they learned about HTML5 to their students this upcoming school year. Ann Gural, Spanish teacher, and Kyle Seiverd, science teacher, both created interactive travel blogs with information, embedded pictures, videos, and various links to information on international destinations. The two teachers were so inspired by what they learned at the camp that they brainstormed together and figured out a way to turn it into a project for their students. They created a code template where students will be able to read instructions, edit information, and choose their own colors, backgrounds, and fonts, while connecting it to content they are studying in their Spanish and science classes. Gural’s students will stick with the travel blog theme she created this summer and Seiverd’s science students will create a page focusing on the impacts of climate change in different parts of the world. The teachers are excited to launch this cross-discipline project in their classrooms later in the year. Gural noted that the students will be graded using a comprehensive rubric looking at several different disciplines, not just the ability to edit the code and create a webpage.